Waiter Coats, Server Coats and Chef Coats for men and women are offered in a variety of styles. Chef Coats have become common place in the Front of the House with the advent of open kitchens and serve as a perfect choice for Waiters and Servers in these environments. 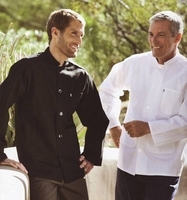 Whether you choose Coolvent Chef Coats, Light Weight Chef Coats or Traditional Chef Coats for your servers they will reflect the art and love of cooking. Our Waiter Coats ,Server Coats and Chef Coats for the Front of the House are all able to be personalized to tie in to your unique identity. Coats are available in many colors and styles and also in various fabrics. Cool vent breathable fabrics are incorporated into selected items for a cool and comfortable wearing garment.